So this cake happened today. I went to the pool and watched my kids do 40 million cannonballs. And waiting for me was a cake. This is, in fact, real life. And there are peanut butter cups involved. And after you eat this cake you will love me too. Crock Pot Peanut Butter Cup Cake. Did you hear me? IN A CROCK POT! I’m caking like it’s 1983. Just mix up your ingredients. And since we’re in the 80’s, let’s start with a cake mix. Then put it in your crock. What a crock it is. And wait a bunch of hours. I suggest you get on with your life during this time. Watching the crock pot work is a losing battle, folks. After the longest 6 1/2 hours of our life you should eat. Cook times may vary slightly based on your crock pot…low on some might be higher than on others. Also, the cake is very loose, more like a pudding-cake. I know how I’m starting my day tomorrow!! I thought you were my heroine before…but oh no. It’s now. AMAZING. 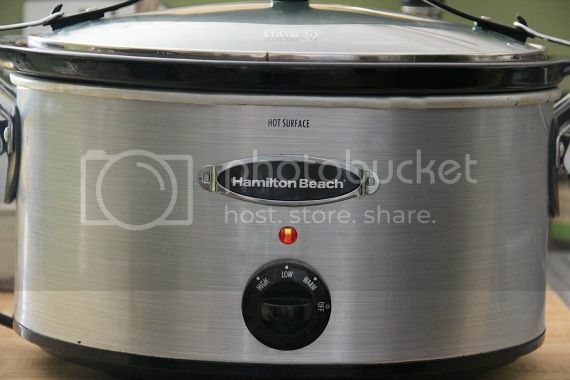 I’ve seen a couple different crock pot dessert recipes in the past day….all of a sudden, slow cookers in the summer. Hey, whatever it takes to make a fab dessert. 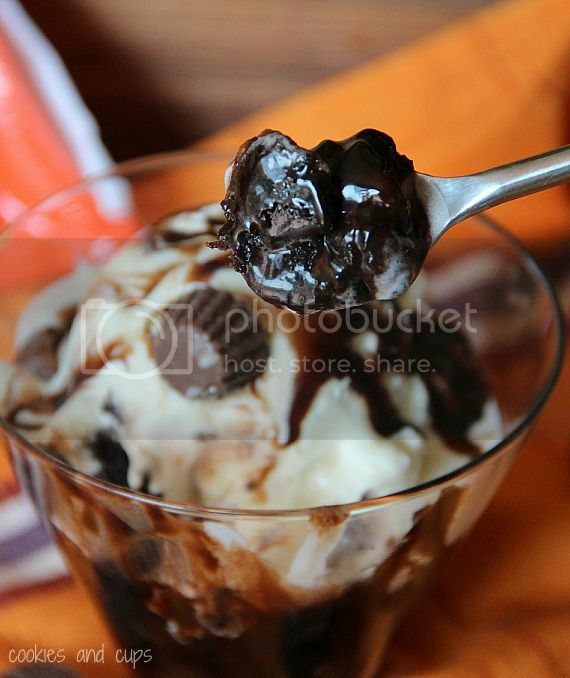 This looks so gooey and amazing…and wonderful! Brilliant that you don’t have to heat up the house on a hottttt day. YUM! I’m on it. You are genius. O.M.G. this looks amazing! I will be trying this! Yuuuuuum! The crock pot cake idea is genius anyway but peanut butter chocolate is way better than the yellow cake/strawberry pie filling one I’ve been making! This so sounds too good to be true! I can’t wait to try it! O freakin mazing! Must make this soon! Such a great idea and looks amazing! Yowzers!! This seriously rocks my world (does anyone even say that anymore?! ), and I cannot wait to try it!!! I must find more crock pot cakes! This is awesome! Beat the heat and cook in a crock pot! I love coming home to food ready to eat in the crock pot and this would be the best thing to find in the crock pot! I could not have dashed over any quicker from Pinterest!!! This is amazing with all that chocolate sauce. Smart in the crock pot! Evil, I tell you. Brilliant, too. I have never made dessert in my crockpot, but I am excited to give it a try! My crockpot is my favorite tool year round! This looks amazballs! I also love that you have a Ziplist feature right on your site. I plan to make this over the 4th of July for our family reunion (mostly because I am afraid I will eat the entire cake if there are no witnesses). If I did not already have some goodies to bring to my Bible Study this Friday I would so be bringing this! I’m looking forward to making it! My two favorite things- chocolate and peanut butter………..and it’s not going to heat the house! YAH! That is pure genius!!! And since we just got a pool pass I know what is going to happen the next pool day:-) So gooey and delicious looking!!! The recipe is so cool! My kids would think this is the coolest thing ever! I neeeeeed this!! It looks so gooey and yummy and absolutely delicious! This could be the best thing to come home to! I love cooking in my crockpot, especially the way it makes the house smell so “homey.” I can’t even imagine how good this must smell…for 6 1/2 hours!!! see it’s stuff like this that makes me happy I have a crock pot, even if it sits in the basement, I so can bring it up to the kitchen. Yummy! Oh please yes! I want to be small enough to swim in that. I too want to go to the pool and come home to this!! Wow! Amazing!! I have to get out my crockpot for this one! Slow cookers in the summer IS brilliant cause it doesn’t heat the oven! I LOVE IT! Holy heck! Crock pots rock! And for desserts? Nice!!! I can’t wait to try it!! Thank you!! You rock! Okay…. this is the GREATEST! I can’t even begin to imagine what my Friday night will be like tomorrow. Of course, I’m trying to figure out if I can just put it in the crock pot when I get home tonight. Hmm…. The best use of a crock pot EVAH!!!!! I was telling my boys we can’t make dessert because it’s too hot to use the oven. You have made me a big, stinkin’ liar! Holy smokes, this looks fantastic!! Now, I need a crock pot. It’s always nice to have a yummy dessert and not have to have the oven on during summer! Love it! So last week I had to bring my blender to work with me because I’m totally addicted to smoothies. This week, I’m totally bringing my crockpot in and we’re having cake at work!! I can’t wait to try this!! Year ago when I bought my crock, I bought all the gadgets that went with it and the right cookbook. Bread, cakes (a special pan) and the roasting rack. Ive been using it and updating my recipes ever since. One of the best investments I ever made…and still going after 35 years. Cool huh? Thanks for a great (my fave flavours) recipe. I’ll be trying this one soon. I am on my way to go dig out my crock pot. . . Amazing!! O.M.G. This might just be the best thing that ever happened…. Did this fill up your crock pot? Mine is smaller. . . I just measured it. It’s, gasp, only 3 quarts! Do you think it could handle this recipe? It looks divine. We always need a treat on Sunday afternoons and it’s going to be 100 here this Sunday! I used an 8 qt crock and it filled about half.. I’m not so sure a 3 qt would work, and if it will all fit, you would most likely have to adjust the baking time. Maybe make half the batter? I have been wanting to buy a crock pot for some time now and this cake just gave me a reason to! It looks so decadent and I love that it takes forever to bake because that just builds the anticipation of it. It is the perfect cake for the summer because you can leave it and go on with your summer fun. You had me at peanut butter cups. I am definitely trying this. Thanks for the recipe. OK, I would love this, however my kids are allergic to peanuts. What do you think I could substitute for the peanut butter? (I’m still going to have to try it and will take it to school to share with staff) Thanks! And to think, I thought that now that I was a vegetarian my crockpot was essentially useless. You’ve proven me wrong! I think the only time I spotted you at BHF was just as you were walking out the door of the closing party to leave…and I just didn’t make it to stall you in time! ACK. Such a fail! holy crap this cake is too good to be true!! and this mini reese’s cups.. I can’t get enough! I baked your reese’s pb banana bread and just posted it, Shelly! ps: hope you didn’t get soaked watching your boys do cannonballs! I was going to wait to make this over the weekend, but did it last night instead….I just have to say it was amaze-balls. Thanks so much for posting it!! Why didn’t I see this this morning. I just wait for 3 hours to have my oil changed, and had my kid with me. Definitely could use this now that I am finally home! I already loved you. Now I love you more. Will be creating this beauty for my church Life group tomorrow. Chocolate and Peanut butter?? IN A CROCKPOT??? This is beyond brilliant! And, I live in a house with 2 little boys and 3 chocolate/peanut butter addicted adults…..We’re doomed. But only in the best possible way!! Thanks for another doozy, Shelly! Looking forward to having this tomorrow. Sounds like there are lots who haven’t cooked dessert in crock pot…. Just FYI, if you place a towel UNDER the lid, the condensation collects on the towel and doesn’t drip back onto your cake. OMG you rock my world!! Loving this – especially how easy it is!! I found this on pinterest and I’m making it today because I’m having some gal friends over for dessert – can’t wait! I know the house is going to smell so good! Want to make this but do i make the cake mix, like a cake mix with the eggs, oil and such and make the pudding with the liquids too? OR do i just add all the ingredients as they are and add them all in and they eventually work it out? HELP!!! oh my, i think i figured it out. I paniced for a bit, lol. Sorry! Do you mix the cake mix like making a normal cake? 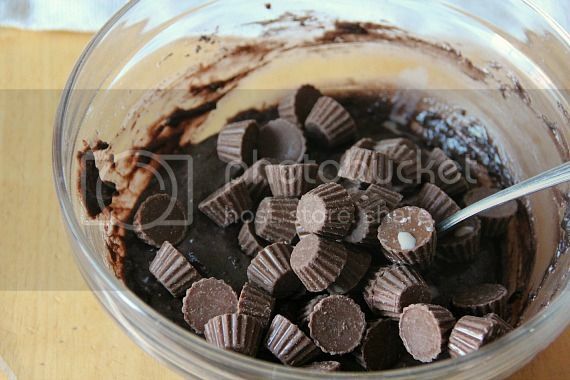 And do you mix the pudding mix with the water like normal or just mix the powder mix with the other ingredients? This looks amazing! Would this work with a larger cockpot? I haven’t ever made this on high…I would imagine that it would work, but again, I haven’t ever tried it! What temp do I put the crock put in? High or low? Did you ever stir it? I had my crock pot on low and started smelling a burning smell just after two hours… The inside isn’t looking done. I’m not sure if I was suppose to stir here and there or my crock might just be a hotter one. Hi I just made this cake and left, ran some errands, went to a movie and came back so excited to eat it! BUT it was burnt all on the outside and we tried the inside but it tastes terrible, nothing like peanut butter cups. Very disappointed :/ I cooked it for 6.5 hours, and followed the ingredient list exactly… Not sure what went wrong but won’t be making this one again. I made this today. I made it exactly like the recipe said. It cooked on low for 5 1/2 hours and it was burnt on the outside. The consistency was weird and it tasted ok. I was very disappointed and I won’t be making it again. I suppose crock pots temperatures all vary, which probably is the reason for yours burning. Low on one brand, might be higher than the low on another. Sorry it didn’t turn out for you! I’m going to give this another try in a different crock to test. Thanks for the feedback!